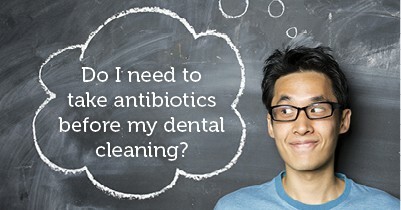 Antibiotics Before my Cleaning: Needed or Not? If you’ve previously been required to take antibiotics before an appointment with your dentist in Long Grove, we have some important news for you. Recent research shows that using antibiotics as a precaution to infection may not serve as a solution, and can possibly create more problems. If you have a heart condition, taking a precautionary antibiotic before visiting your dentist, even for a cleaning, used to be a common recommendation. However, according to the American Heart Association, this is no longer necessary for most people and could even harm a healthy patient. After numerous studies were made public, the guidelines for using antibiotics to reduce the risk of infection have been revised. Based on the evidence, the risks associated with taking preventive antibiotics may outweigh the benefits. Risks include negative reactions to the medication as well as actually increasing the chance of infection. The overuse of antibiotics leads to bacteria becoming immune to the medicine. Resistance to antibiotics allows bacteria to thrive, leading to infections despite the effort to circumvent it. Additionally, antibiotic resistant bacteria may cause more severe infections and lasting medical damage. Patients with these conditions are at the greatest risk of seriously bad outcomes if a heart infection develops. Despite the diagnosis of your condition, we encourage all of our heart patients to talk to their cardiologist prior to their dental appointments to see if taking antibiotics is right for you. While taking an antibiotic before visits to your Long Grove dentist may no longer be necessary, it’s still important to keep the number of bacteria in your mouth low. We do this by working together to instill a healthy at-home hygiene routine in addition to regular visits to my dental office in Long Grove. The best way to reduce your chance of greater infection throughout your body is start with a healthy mouth. Together, we can help keep bacteria and infection away. Serving patients in Long Grove, Buffalo Grove, and Lake Zurich.